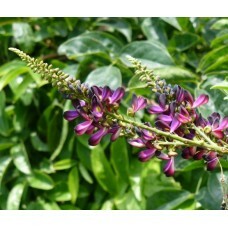 Botanical Name Millettia reticulata Features An attractive Asian vine that does resemble Wisteria (but is not in fact a Wisteria) and has dark purple-red flower clusters that are held above the foliage. A good fast-growing vine for the large arbor, pergola, or chain link fence. Genus Description Millettia is a genus of about 120 species of deciduous and evergreen trees, shrubs, and woody-stemmed climbers from deciduous and evergreen woodland in Africa, Madagascar, India, and E. Asia. They have pinnate leaves, with lance-­shaped to broadly ovate leaflets, borne alternately or in opposite pairs. Pea-like flowers are produced in terminal and lateral racemes or panicles, similar to those of wisterias. Where not hardy, grow in a cool or temperate green­house. In milder areas, grow as specimen trees or shrubs, and use climbers to clothe a fence, arch, pergola, or trellis. The reticulate specie is twining, woody climber or scandent shrub bearing pinnate leaves with 5-9 lance-shaped to elliptic, semi- leathery leaflets, 1¼ -3 ½ in long. In summer, produces pea-like, rose-pink, red, or blue flowers, to ½ in long, in dense racemes or panicles, 6-8in long. Cultivation Under glass, grow in soil-based potting mix in full light, with shade from hot sun. When in growth, water freely and apply a balanced liquid fertilizer monthly; water sparingly in winter. Outdoors, grow in moderately fertile, well-drained soil in full sun. Trim annually, as needed: after flowering, if flowering on previous year’s growth, or from late winter to spring, if flowering on current year’s growth. Trim to fit available space; carry out renovation pruning as needed. Pests and Diseases Whiteflies, aphids, and spider mites may be troublesome under glass.